Detail from William Hogarth, The Polling (from the Humours of an Election series), 1755. The recent revelations about Cambridge Analytica have prompted a new and strange kind of anxiety: What if your political opinions are not actually yours? The secretive firm have been accused of harvesting the data of fifty million Facebook users and using it to create targeted political advertisements. Implicit in the fears that swirl around Cambridge Analytica is a deeply ingrained ideal about how politics should best be conducted. As individuals and citizens with unique experiences of the world, the idea goes, it is incumbent upon us to develop an informed set of ideas and preferences. These innermost beliefs and desires form the bedrock of our political subjectivities. On election days we express these beliefs and desires as a vote. Votes are curious things. They are supposed to be both informed yet subjective, something independent from the views of your immediate community or even your family. Behind the fear that creepy data firms are manipulating election results is the suggestion that people’s political beliefs might no longer be their own, but someone else’s. Witness a recent interview by CNN of a woman in Florida who had managed a Donald Trump supporters’ page on Facebook. It transpired that the page had been originally created by a Russian organization with an alleged link to the Kremlin. The woman is skeptical in the face of the reporter’s line of questioning. He accuses her of “posting and re-posting almost word for word” information that was being generated by the Russian organization. She is indignant. She responds by saying that all of the people that came to her events were Trump supporters who she knew personally. The clip has gone viral and the implication is that the mechanism through which this woman is expected to have independently arrived at her political opinions has broken down. Her politics, the interview suggests, are therefore illegitimate — perhaps even not her own to begin with. The right to vote comes with a right to a unique political opinion. In the voting booth, you are free to vote for whoever you wish and you are beholden only to yourself. Being there, pencil in hand, can feel both enormously consequential and thrillingly secretive. Elections once looked very different. One way of trying to understand the anxieties that swirl around Cambridge Analytica or the manipulation of opinion through online “fake news” more broadly, is to look at the history of this conception of politics. The idea that your vote is like property, something that you own and that should be hidden away and treasured, is a relatively recent one. Britain, a country that has had a relatively unbroken series of parliamentary elections for hundreds of years provides a vivid example of the emergence the modern political self through the ritual of voting. Imagine that you live in eighteenth-century Britain and it is election day. Let’s say you are among the minority of people who are allowed to vote. This means that you are likely (although not necessarily at this time) male and that you probably own land. Voting in the eighteenth century was an all-day affair. First you travel a considerable distance to the only polling station in your constituency. When you arrive, you see an elevated wooden platform, not dissimilar to a hangman’s gallows. This platform, called a “hustings”, has been hastily erected in a visible place in the middle of your constituency’s community. Along with the other electors, you assemble nervously at the foot of the hustings, waiting for your name to be called. Once this happens, you climb up the steps to the platform and announce, out loud, the name of your favoured candidate. Everything is taking place in front of an unruly crowd of men, women, and children. Although most of this crowd wouldn’t have had the privilege of voting themselves, they are certainly participating. They stare each elector in the eyes as they announce their vote, holding their decisions to account. When the winner is announced he is ritually paraded around the community in a giant wooden chair, an event that would usually terminate in a preposterous, booze-fuelled riot. 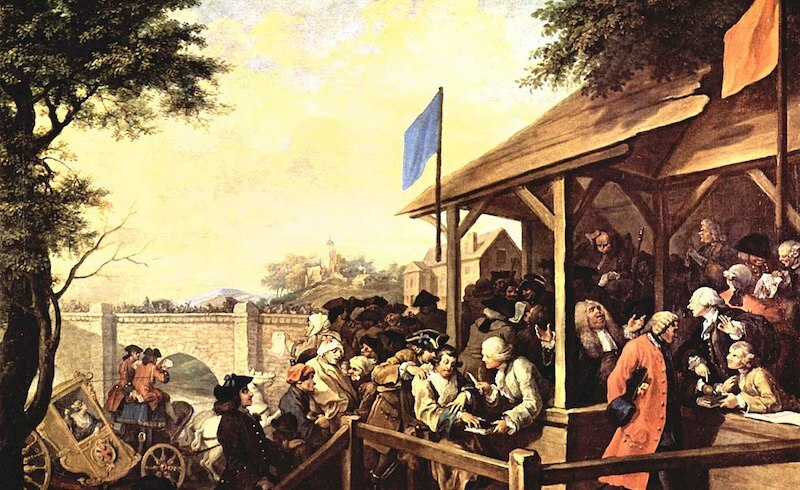 The stages of a premodern election are brilliantly depicted by the eighteenth-century artist Hogarth, who painted rural Britons crowding into the back rooms of pubs where they were “treated” to liquor by prospective members of parliament, whether they were allowed to vote or not. In his paintings, there is endemic chaos at every stage of the process. Wild pigs run underfoot. Now imagine that a hundred years has passed. It is the late nineteenth century. Voting now takes place in secret, behind a velvet curtain. Instead of a central hustings there are multiple polling stations spread evenly across the constituency. The candidates are absent and so is the crowd — banished from interfering with the election. Your vote, once thought of as a public act designed to represent the interests of an assembled community, is now yours alone to do what you want with. The candidates, now members of formalized parties, have been campaigning in ticketed meeting halls. They have been distributing dense manifestos written solely for the educated. They are no longer allowed to shower their constituents with booze and other treats. Doing so would be risk being accused of a new thing called “corruption.” Although many more people were allowed vote, the act of voting, and the meaning of politics itself has forever changed. The secret ballot, the idea that voting should be sealed away in silent, confessional booths was introduced in Britain in 1872 after experiments in Australia and New Zealand. France briefly adopted the secret ballot in the aftermath of its 1789 and 1848 revolutions. In America, this vision of politics was hammered into place by progressives in the late nineteenth century as a way of breaking the power of urban political machines. Before the 1890s it was commonplace for parties or representatives of newspapers to stand outside polling booths with colored polling cards representing the different parties. You simply took a pre-completed card matching the color of your preferred party, then dropped it off in the ballot box. Split ticket voting was almost impossible — to do this you had to cut out a piece of paper and stick it onto your party card. These extra strips of paper tended to detach themselves if the ballot box was shaken (which it invariably was). Under this system, everyone could see who you voted for, and you didn’t have to be literate to participate. A wave of progressive era reform saw these ballots replaced with complex lists that required both literacy and knowledge of the name of your preferred candidate. As in Britain, voting began to take place in secret booths. As British historians such as James Vernon have shown, the privatization of political decision making in the nineteenth century served first to disenfranchise. It created a process that only literate, propertied men were permitted to participate in. The 1832 Reform Act, famous for enfranchising the middle classes in England, was also the first time that women were formally excluded from voting (women voters were rare before 1832, but were not unheard of and rich women could vote if they inherited their husband’s property). Almost every US state’s constitution, when it was first drawn up, explicitly excluded women from the vote. The exception was New Jersey, who left out such a clause, possibly by accident, until 1807. The suppression of African Americans who attempted to vote during Jim Crow with bogus literacy tests and impossible ID requirements was another means of policing who was and who was not deemed fit to be an individual political subject. By the late twentieth century this conception of the relationship between politics and the individual citizen had spread to most places in the world. Voting had become personal rather than communal, private rather than public, and political ideas were supposed to be formed in the cold light of sober reason. What we think of as democracy was born during this period and it had as much to do with how people participated in politics as who got to participate. The individualization of politics was ideally complemented by the emergence of a robust public sphere. Liberated from powerful machine bosses or the eyes of the crowd one had to find other means of forming one’s politics. Citizens, for the first time, had to be “informed.” It was incumbent upon all of us, suddenly, to read newspapers, participate in respectful debates, attend political rallies and read manifestos and campaign literature. For the German philosopher Jürgen Habermas, the emergence of the public sphere — a space located somewhere between the state and the private household — was inseparable from the emergence of bourgeois modernity. It was in this space of coffee shops, town squares, private members clubs and through print media that independent thought was supposed to emerge. In the public sphere, voters were supposed to disavow their innate prejudices and come to rational conclusions about how to use their influence. Needless to say, the public sphere was always a fantasy. In nineteenth-century Britain, the meeting houses and coffee shops where rational discussion was meant to take place were mostly, if not entirely male spaces. In twentieth century America, much public space was, first de jure then de facto, segregated by race. “Rational” thought, as something untethered from individual experience or power relations, is an illusion. As feminists and postcolonial critics have long argued the equation of politics with “reason” has the tendency to reinforce rather than challenge existing power relations. The idea that electoral power should cohere in individuals rather than groups continues to be the dominant way of thinking about politics. We associate democracy with the expression of millions of isolated votes, arrived at independently, and conducted in secret. We still live with this conception of politics, but it is coming under intolerable pressure. Theorists from various different disciplines have long known that people’s desires and preferences are shaped by massive forces beyond their control. The essential problem of false consciousness for Marxists stems from this tension. Meanwhile, increasingly sophisticated models of voter behaviour can predict, based on address, income, race, gender, religion, and countless other traits, who any individual will vote for. The idea that the sovereign mind of the voter may not be as sovereign as we might hope is instinctive, but is nothing new. What is new in the debates that have emerged in the last few years about the effect of “fake news," of targeted stories aimed at millions based on data breaches, and of Russian intervention in Western elections is the fear that people’s politics are being shaped, not by vast social processes or by facets of their identity, but by deliberate and invisible forces. By obtaining your data companies like Cambridge Analytica, some worry, know you better than you know yourself, and can rule your mind without your knowledge. It is extremely unlikely that either “fake news” or Russian interference had a tangible impact on the 2016 presidential election or the EU referendum in Britain. On the contrary, it seems clear that these claims offer a deus ex machina, designed to avoid asking difficult questions about the implosion of a neoliberal settlement that can no longer command political consent. What is striking, however, is how the present anxiety about firms such as Cambridge Analytica has distant echoes of the century in which the individual political subject was born. In fears over the manipulation of voters by secret algorithms controlled by nefarious and invisible agents you see a re-emergence of something like the “corruption” of the nineteenth century, the intoxicating bribery of candidates or the social pressure of the crowd. The free thinking political subject, quietly forged in nineteenth century polling booths, is under pressure like never before. Whether or not firms like Cambridge Analytica were as successful in manipulating elections as some of its executives have boasted, it is increasingly the case that the secretive and individualized way of thinking about voting that emerged in the nineteenth century is unsuited to our present age. This is partly because the myth of a democratic public sphere is becoming harder to maintain. As large private and state media organizations lose their monopolies and their resources, the production and consumption of knowledge is becoming atomized and mysterious. People’s politics are generated and honed online and often out of sight in ways that are oblique. The ideas and desires that people produce under these conditions are not, as many seem to fear, illegitimate or manipulated, but rather they lack the shared reference points of singular national or global conversations. Meanwhile, public urban space continues to vanish. Canvassing for the Labour Party in London in the election last year is a lesson in how many voters, particularly the rich, have succeeded in isolating their homes from city streets in gated communities where no political leaflets or get out the vote campaigns can reach. This was even true in London’s large public housing estates. Many of these estates were designed generations ago by architects who wanted to produce new communities by providing generous amounts of common space. Since the 1980s and 1990s, guided by the ill-conceived notion that fortified space can reduce crime statistics these common spaces have been segmented and securitized — made impossible for canvassers or leaflet deliverers to reach without the correct keys. Friends of mine who worked on campaigns in Nevada, meanwhile, described being confronted by tall gates and elaborate security operations at every turn. The modern voter is a creation of nineteenth century bourgeois social politics, marooned in an increasingly deracinated world where political decisions are made in unfathomable ways, out of sight, and oftentimes beyond the reach of party organizations. As our unprecedented political crisis rumbles on from nation to nation, severing political unions and electing far right leaders, we are seeing an extraordinary shift in the people and ideas that are seizing the reigns of power. Beneath the surface of these events something else just as consequential might be beginning to take place. We seem to be losing faith in the capacity of the individual political subject — the citizen in the voting booth — to be the building block of democratic politics. Could this century, like the nineteenth century, be about to witness a reinvention of democracy itself? Sam Wetherell is a lecturer in the history of Britain and the world at the University of York. He writes about cities, art, and the economy.